Motor racing under lights.. avoiding the uV powered sun.. There's been some very close racing, and perhaps more braking/power down than straight line/aero so it could be interesting. a new surface should change things up we hope. Seeing the big sweeping pit entry at PI on the weekend, Im still bemused why they dont use the same one at Barbagallo instead of the right angle pit entry at the after turning onto the main straight. New surface should save a lot of people a great deal of money in tyres. Not sure if it will make the V8 racing better however as the massive tyre deg was always a talking point for the venue. Not sure if it will make the V8 racing better however as the massive tyre deg was always a talking point for the venue. This crossed my mind as well. It was always one of the things that appealed to me knowing we would see different strategies, extra stops for new rubber and overall tyre management to give us interesting finishes and late runs through the field such as Lowndes and others in past years. I hope that aspect of Perth does not disappear. SO we still can't be sure if JLB will be at Perth. We also can't be sure there is actually an issue at Tekno, or isn't. Why can't some of these investigative journalists who indicate there is some unrest, actually put their testicles on the line and describe what that unrest actually is? - Is it Jono being a bit tight with his cheque book to JLB? - Is it Jono being a bit tight with his cheque book to 888E? - Is it JLB not liking the performance package Tekno are providing? - Is it Jono not liking the driving performance of JLB? And on the other side, why can't Jono just come out and say what is happening? "We are just concentrating on racing over this weekend, and we'll look at the driver situation after"... what a load of twaddle. Surely he he has mapped out on a whiteboard somewhere what is happening if either of a couple of scenarios occur, whatever those scenarios may be? Well Will Davo left allegedly after not being paid..
wasn't there rumours last year of slow payments to all. 30 day accounts crept out a bit? If I recall, the reason was the approach speeds were too high, that if something went wrong, it could be bad for others. Not that I agree with those sentiments of course. The entry after the final corner looks clumsy at best. Well the sand that surrounds the circuit will ensure it eventually returns to a cheese cutter surface but I hope we can get a few years of not shredding front lefts. Make running pb’s the expectation not just the hope. Makes even me look forward to the next time I can get out there. Anyway we will see some Hollywood number come qualifying. Jason Bright has a 55.9 record. How much you reckon the current generation of cars will beat that by? Yes it is downhill and would be speedy, but could always reduce that I guess. They look speedy at PI also. You would definitely be correct in saying the other entry looks clumsy, its a joke really. 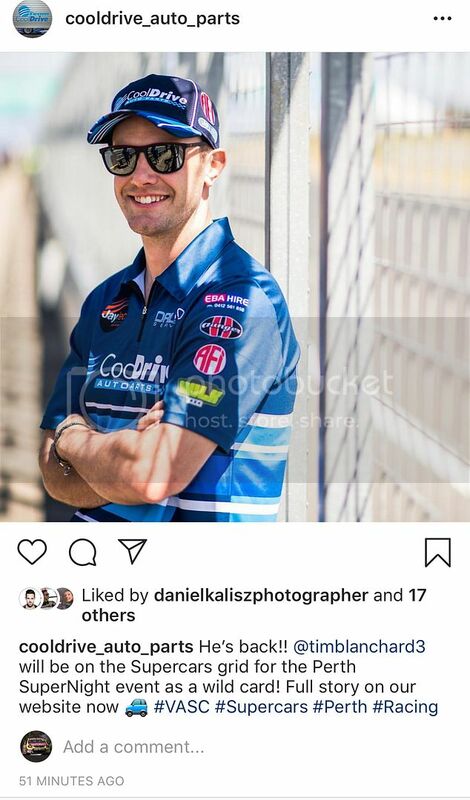 Changes before Barbagallo would be totally untenable, as PI clearly showed aerodynamic parity between all three brands since all three brands were represented on the podium!